Never Yet Melted » Do It! Do It! Kevin Baker, in the New Republic, concludes that the Left really is screwed politically nationally, permanently limited to political control of its one-party-state metropolitan satrapies. 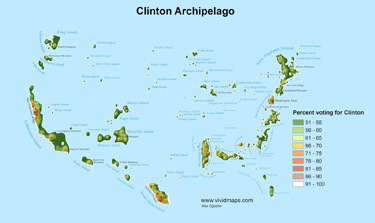 The Clinton Archipelago, he concludes, cannot literally secede, but the answer he proposes is de facto secession. The rest of us are supposed to become upset when the liberals shut up, go away, and start leaving the rest of us alone. What a nightmare! What are we in Blue America going to do about it? What would it mean to remove ourselves as far as possible from the federal government? 6 Feedbacks on "Do It! Do It!" Ah, just how are you going assure that only the best and brightest from the outside world come to your little paradise? Would that mean immigration control? What energy will you use and how will you pay for it. What will you eat and how will you pay for it? As for FEMA and all the other Fed benefits the red areas did with out them before. Long ago when the South seceded they based their optimism on many things (military experience, etc) some of which was true and prove to be formidable obstacles for the North to overcome. But their #1 reason for optimism cotton (the North can’t live without and the world will intervene to keep markets) proved to be an illusion that was fatal. Are you sure you do not live under some illusions Mr. Baker? Some which are fatal? And all wed hafta do is sit back and wait for it to implode. Sounds like they’re threatening to take their ball and go home, assuming they can find one. <i.There are still a few kinks to work out, of course. What to do, for instance, about the likes of Illinois and Minnesota, blue states adrift in a red sea? The pension problems of Illinois are very well-known. As Mr. Baker wants to cut federal spending, he is implicitly stating that blue states with pension problems do not merit a federal bailout. I agree with Mr. Baker on that point. There are still a few kinks to work out, of course. What to do, for instance, about the likes of Illinois and Minnesota, blue states adrift in a red sea?